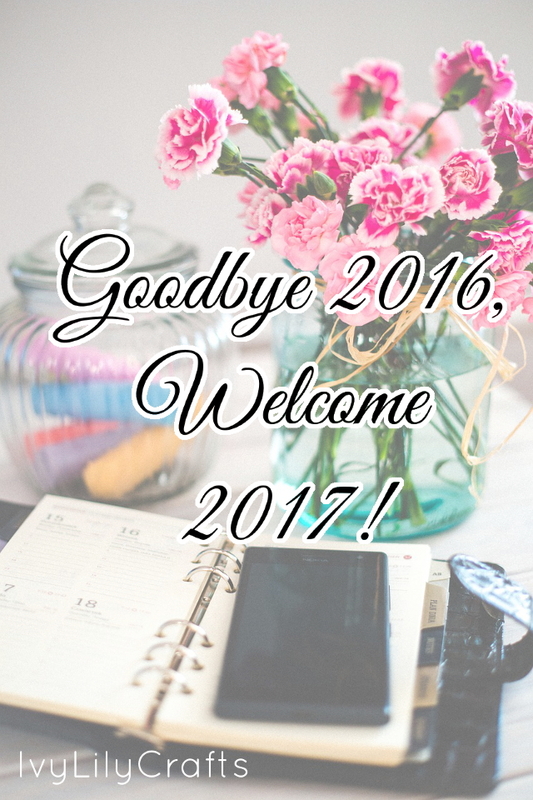 My blogging goals for 2016 were to make longer, more informative blog posts and to niche down or limit my topics to art and DIY. I think I met these two goals pretty well. I've written more in depth blog posts, especially art tutorials and other art related topics. They take longer to write (I started writing this one in September, haha) so I decided not to stress about publishing a certain amount of posts per month. During the summer months I published barely any posts at all. Part of the reason was that I started focusing more on my YouTube channel and posting videos regularly (one video per week). There's just not enough time to do both YouTube and blogging on a weekly schedule, if you have a day job or are studying full time. By the way, I also put together a video showing my 2016 art and crafts. The other reason was that I wanted to make evergreen blog posts that would be found through Google search and that can be linked to months later and still be relevant and useful. 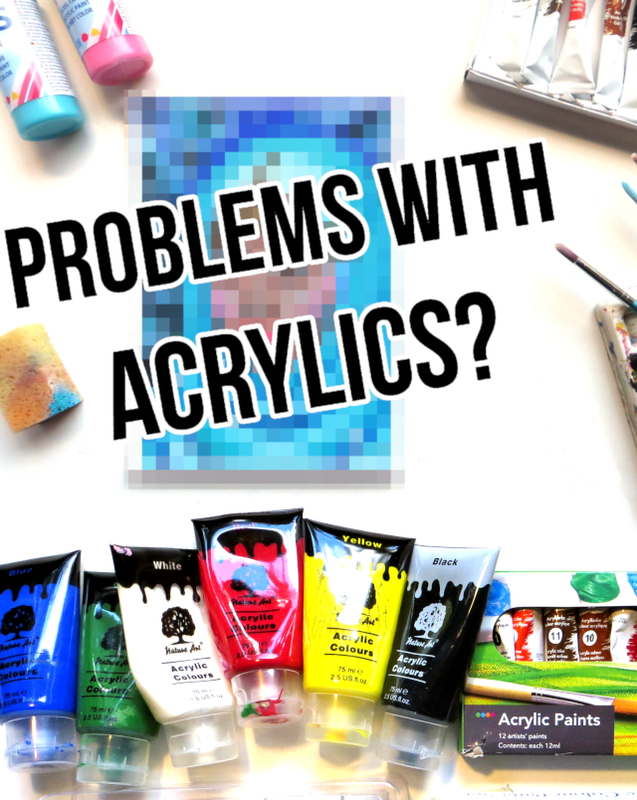 I still update my How to Make Art/DIY Videos on YouTube blog post when I learn new tips, for example. What I'm trying to steer away from are pictures posts of cute letters I've received with a couple of lines of text. That's what I used to blog about and those posts don't get search engine traffic months or years later. Some of my 2016 paintings. I also held my first giveaway, when my YouTube channel reached 100 subscribers in June. It was more work than I thought it would be. I wanted to make the giveaway through a giveaway site and had to research different ones (Kingsumo, Sweeptakes, Gleam.io, Rafflecopter, Viral Sweep, Promo Simple, Wildfire, Giveaway tools...) and even then it was difficult to choose, because none of them did exactly what I wanted in addition to being free. I settled with Gleam.io. I chose a digital prize so I wouldn't have to ship it. After choosing the giveaway widget tool, I had make the giveaway and the rules, prepare the prize (the prize was my printable coloring book, but I re-scanned and edited it to increase the quality), make a video announcing the giveaway, make a blog post and share the video/post on Twitter, Pinterest, Instagram and Facebook and to my email list. After the giveaway was over, I drew the winner (well, the giveaway widget drew the winner), I sent the prize via email, made a discount code for my Etsy store, made a video announcing the winner and giving out the discount code and again shared that to my blog, email list and social media accounts. My goal for the giveaway was to A) get more YouTube subscribers, B) get more people who are interested in adult coloring books to join my email list, C) have some of the people who didn't win, buy the coloring book from my Etsy shop with the discount price, D) build my other social media following and E) give a lot extra entries to people who share the giveaway to spread the word faster. That was maybe a few too many goals for one giveaway... I didn't find a giveaway widget that allowed all those social media entries, collected email addresses and gave extra points for sharing the giveaway (and would do all that for free). So I gave up on collecting emails. It was still one entry option, but you could enter without joining my email list. So, what happened to those goals? I did get 20 new YouTube subscribers during the giveaway. But that was about it. My email list grew by two subscribers. Etsy coupon code was not used. Getting extra entries through sharing the giveaway was used once. What would I change for the next giveaway? Next time I would run the giveaway for longer than two weeks, maybe for a month. I would set one goal for the giveaway. So, either growing my email list or one social media platform. And probably have a bigger prize, but still something that attracts only the right people to avoid unfollows after the giveaway is over. I think my whole mindset on blogging has slowly been changing since the end of 2013. Blogging and art and other things they led to have become more than a hobby to me. I'm not calling myself a professional or saying that I make a significant amount of money through them (I'll go more into that topic later). I'm just saying that I take them more seriously now. I also enjoy reading blog posts, watching YouTube videos and listening to podcasts about business, blogging, art and YouTube tips. I've especially liked listening to Smart Passive Income, The Creative Penn, The Abundant Artist and Etsy Conversation podcasts. I plan ahead with my YouTube video schedule. I used to publish blog posts about what I wanted, when I wanted. I would call that a hobby. But this year I decided to take part in Inktober (making ink drawings every day or every week in October) and started gathering and sketching ideas already in the summer. I even started thinking about Christmas video ideas in the summer. In 2015 I published a Christmas cookie decorating video on December 23rd. That's a little bit late... However, I got really busy at the end of November - beginning of December this year and fell off my video schedule and got new coloring products up in my shop too late. So, in 2017 I need to plan and work ahead for Christmas time even more. I started using a calendar more efficiently. Besides work, studying, other obligations or events, I started marking down things like writing blog posts, filming or editing videos, Etsy/Redbubble sales, writing newsletter emails, webinars I watched. I also got an A4 size hardback journal to write my blog, video and Etsy product ideas in. I'm interacting with other bloggers or more specifically youtubers more, commenting more. I improved the quality of my printable coloring pages and art prints by scanning them in higher resolution (300 or 600 dpi instead of 200 dpi). I'm prioritizing and niching down. 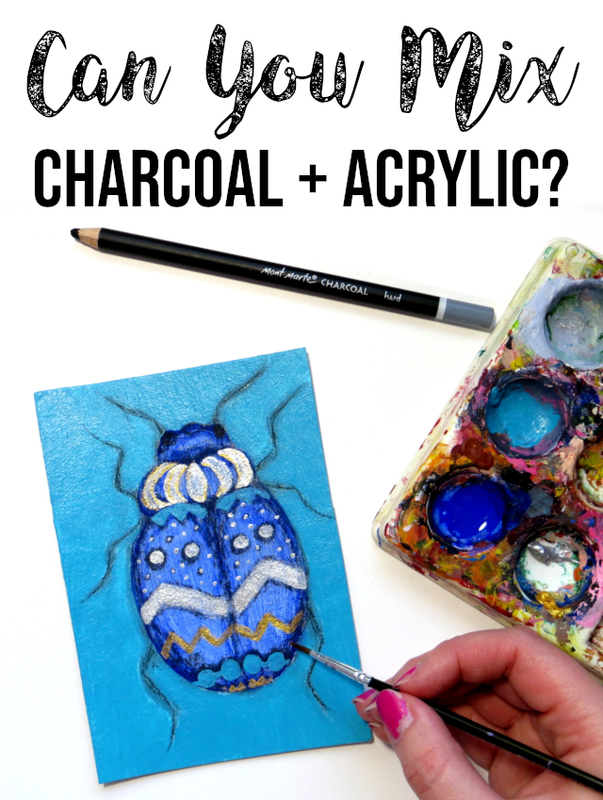 My blog (and YouTube channel) used to be about so many topics: crafts, art, snail mail, traveling, garden... I've finally understood that my blog does not have to include all my interests. And writing about too many topics will repel people who only like one of them. I've narrowed my niche down to art and crafts. There's still room to lose one, but I'm not ready to make the choice so I'm trying to make them work together. I started building an email list. Different platforms through which people follow your blog, can vanish any time. One Finnish site for following blogs was closed down in the spring, for example. But people will still use their email so it makes sense to build an email list. I've made several opt-in freebies for incentives to join the email list. And I continue to make and send exclusive freebies to my email list subscribers from time to time. I realized you don't have to avoid popular topics like tags, challenges or trends, because "everyone is writing or making videos about them". You're not copying others if you take a popular topic and make your version of it. You're just being smart. That's how you and your other content will get found. I started 2016 with less than 40 YouTube subscribers and ended it with 300, which I'm really happy about. But I still feel like it's more important to make SEO (search engine optimization) friendly, searchable videos, than to grow your subscriber count. My most popular YouTube videos have over 7000 views and over 50% of the views come through YouTube search. 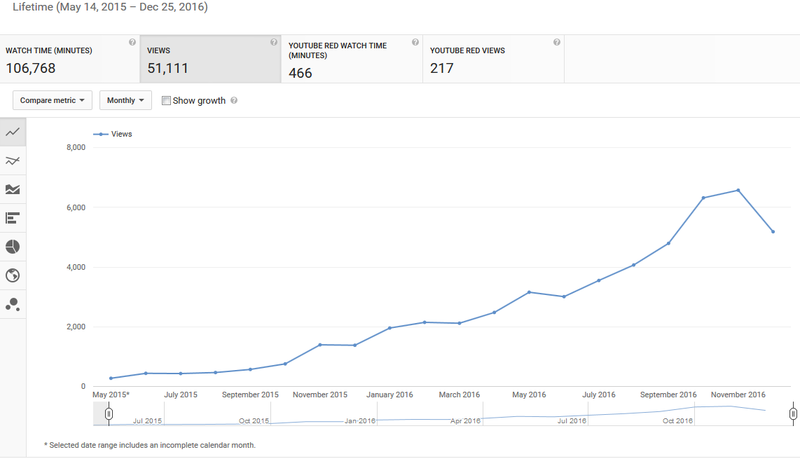 Many youtubers have been complaining about their views dropping in the last months, but my views are increasing. The graph below shows the monthly views on my YouTube channel since the beginning (May 2015 - December 2016). It appears that there's a drop in December 2016, but that's because the statistics are still missing the last week of December. My advice is that you have to do keyword research. Start writing your topic idea for a video in the YouTube search box and see what it suggests. The suggestions are popular searches made on YouTube and you need to choose your title from those suggestions in order for it to be found. Another factor is the amount of competition. Choose a longer phrase out of those suggestions to narrow down the competition. Use the video description to write about the topic and make sure to mention the keywords in the text, especially in the first few sentences (you have 5000 characters for the description). Add all different variations of your video title in the tags (you have 500 characters for the tags). You can also do this for your older videos. 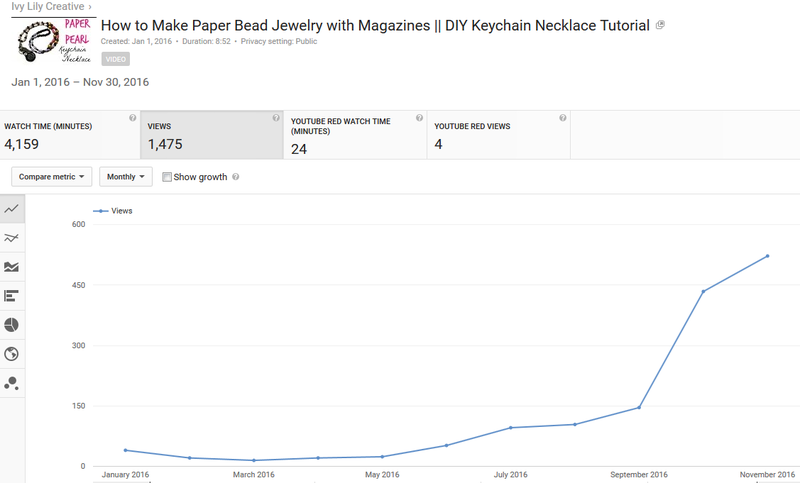 I've gotten some old videos to peak in views by changing the title, description and tags months after publishing the video. 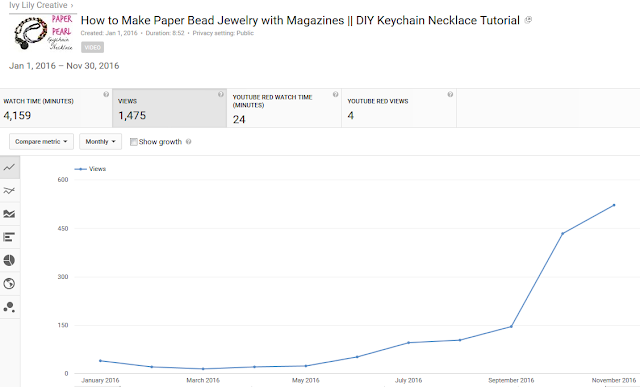 You can see the monthly views graph of my Paper Bead tutorial video as an example below. I use Twitter to share my new (and old) art, videos, tips and blog posts, retweet art I love and share YouTube videos by others artists and crafters. I use Buffer (the free plan) for scheduling tweets so there won't be long pauses between them. Otherwise I tweet more on some weeks and less on others. I try to make my public Pinterest boards to cater to my audience and keep unrelevant boards hidden. I use the hidden boards to store ideas for paintings, for example. I took advantage of the free trial of BoardBooster for scheduling Pinterest pins and liked it a lot. I even paid for it for a couple of months afterwards, but then cancelled the order, 'cause I felt like it wasn't useful enough or I wasn't using it to its full potential. I started an Instagram account for my art and a made a Facebook page for my YouTube channel and blog this year. I use Instagram through Bluestacks on my laptop and edit the pictures in GIMP before uploading to Instagram. Instagram is pretty nice to grow through hashtags, finding other artists and liking and commenting. I'm not actively trying to grow my Facebook following. I just wanted to give the option to follow my art and DIY tutorials through it, because at least one of my videos got a big boost from Facebook before. My Facebook posts are automated through IFTTT. I have not figured out the conundrum of how to make more than pocket money with blogging. However, I do have some passive income systems set up. I sell printable coloring pages through Etsy. Since the products are digital, I don't have to do anything when I get a sale, Etsy handles the payment and sending out the product. 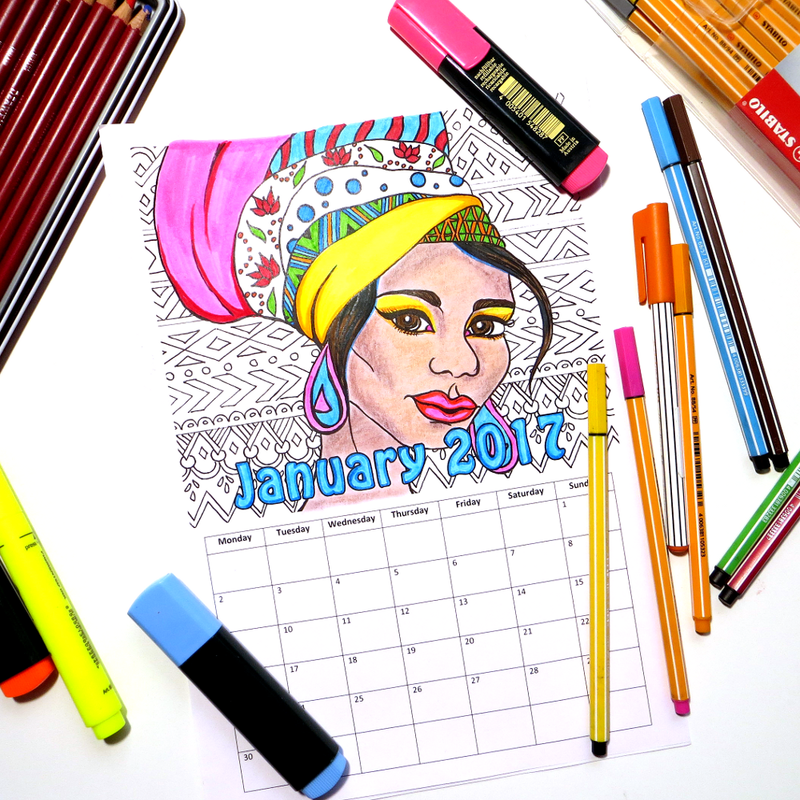 I made two other coloring products around the end of the year as well: Christmas coloring cards and 2017 coloring calendar. 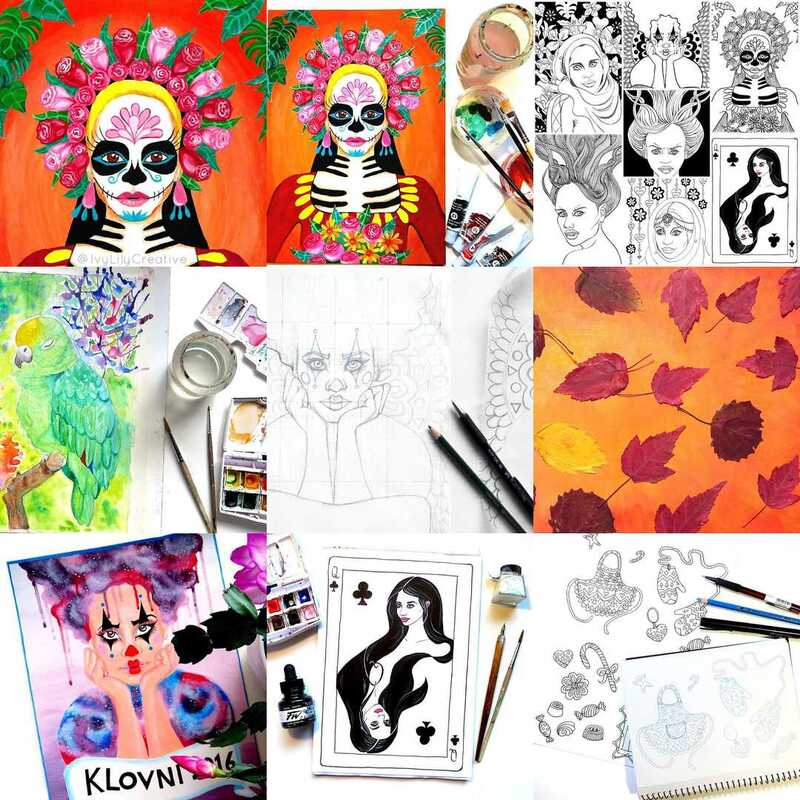 I also sell art prints and other products with my art printed on it in Redbubble and Society6. Again, I just make the art, edit it and upload it once and it can be sold multiple times and RB or S6 will handle orders and shipping. I have a Google Adsense account and my YouTube channel is monetized through it. I also decided to put up an ad space in my blog this year as a trial. 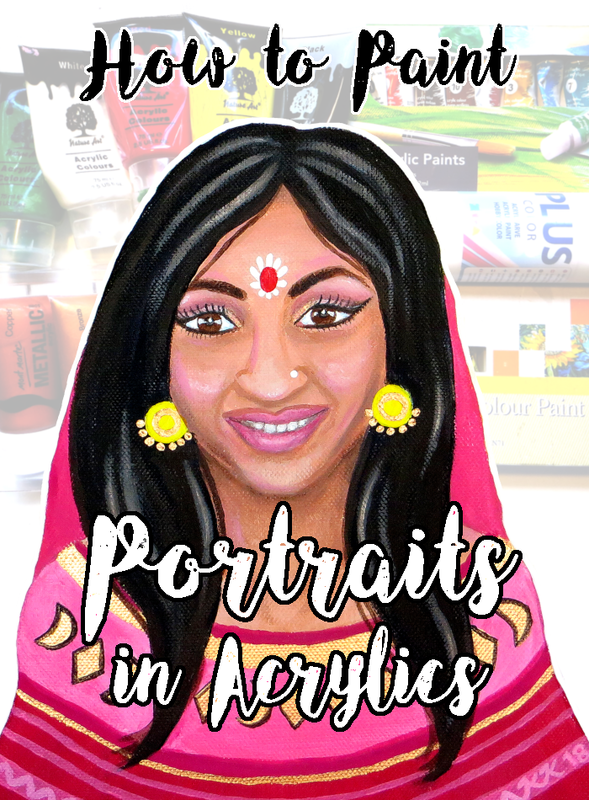 And I started using Amazon affiliate links, when I write about products like art supplies. I'm aiming upload weekly on my YouTube channel. 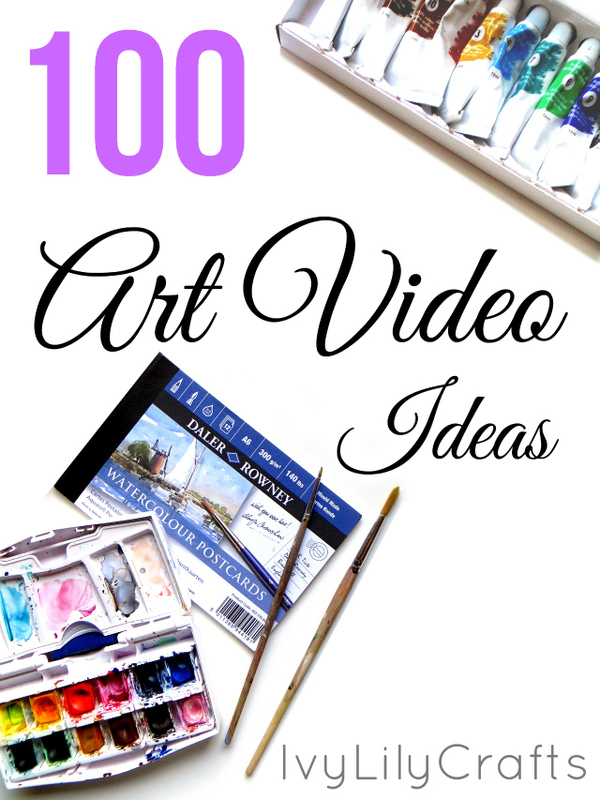 And the types of videos I make are speed paintings, art challenges, coloring or "color with me" videos, quick art tips, DIY videos and ASMR arts and crafts. I especially want to make one speed painting and one DIY each month, on average. The blog will be is less scheduled and there won't be content as often, but the content I do make, I'll try to make as informative as possible. I want to make myself as useful as I can in 2017. I'll try to follow the feedback I get on my videos through comments, the responses I get to my email newsletters, view counts of my videos and Twitter poll results to determine my future videos, blog posts, freebies and coloring products. Please vote which type of tutorial videos you'd like to see in 2017! 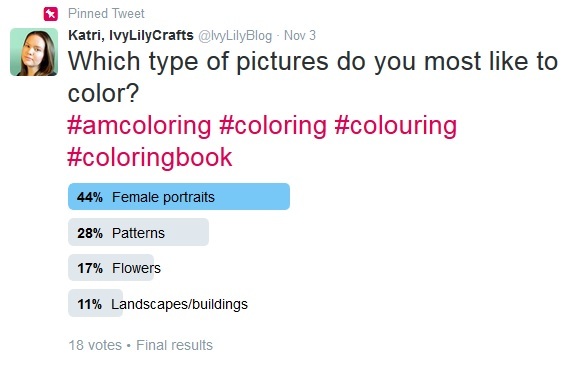 Twitter poll in November about coloring page topics. I need to document my income and expenses better. I should also start sending out email newsletters more regularly. Maybe twice a month, because I was able to keep up with weekly newsletters for about a month, got overwhelmed and went months without sending newsletters. In terms of products, one of my goals is to make a POD (print-on-demand) coloring book for Amazon through CreateSpace. I've only made digital download coloring products so far and I want to a physical one, too. I also want to make another coloring calendar and other coloring products like stationery and bookmarks. I got into oil painting right at the end of the year and I'm sure I'll make more oil paintings in 2017. When I got into drawing in my early teens, I would draw celebrity portraits all the time. I started steering away from celebrities and fan art years ago due to copyright reasons. But I think I'll give in again and make a few fan art pieces in 2017.